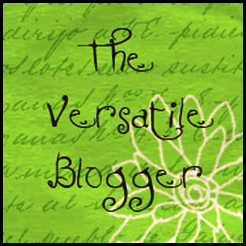 Yeah, I was recently awarded the Versatile Blogger Award. My other blog has won this three times and I was waiting for one of my followers to forward the award onto this blog. I want to say a big thank you to Aprile at http://www.thesteadyhandblog.com/ who nominated me for this award last month. I know they are not true awards but I am happy to accept and it is nice to pass around some links! This award comes with some rules. Thanks again to Apile for her thoughts. I love that your favorite food is Cous Cous, that is the first time I have heard that as an answer. Cool! Thank-you so much for the special "Versatile Blogger" Award! I'm curious about upcycling and heading over to your post to check it out right now. Thanks again!! Wow! Erm.. I didn't even know anybody actually noticed my blog! What a nice surprise. Really, thank you so much! That is very nice of you! Thanks! Thanks so much for the award!! Most kind of you!